If you want to use one of our cool new Rapide tail lights as a side-mount tag-light setup, then this is the bracket for you. 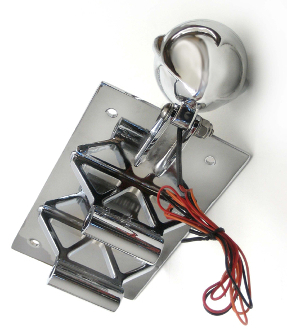 Fabricated in steel and triple chrome plated with mount tabs for a Rapide tail light (tail light is not included). Just weld a couple of simple tabs on you frame and bolt this on. This is for a right side mount. This item measures approximately 4.0" wide X 2.4" deep X 7.25" high.